Are You Confused about Google’s New Ranking Signal? 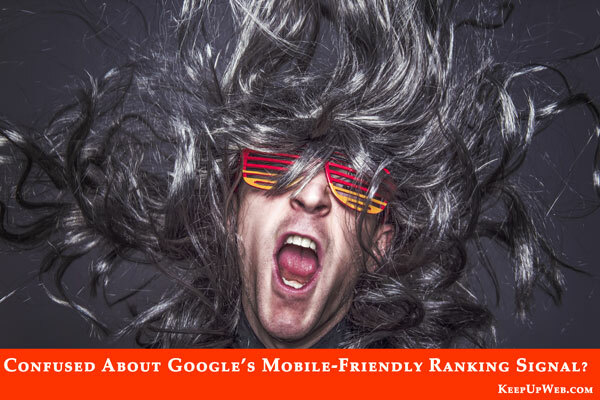 Last week, in my post Are You Ready for the Google Mobile Friendly Algorithm?, I shared resources about Google’s announcement that on April 21st, they plan on including mobile responsiveness as a ranking signal. This week, let’s take a closer look at what Google is really trying to achieve here and that is to focus on UX (user experience). Well, (as I’m sure you know), once Google stated that this change “will have a significant impact in our search results”, the blogosphere went abuzz. Understandably, that sent a lot of us to test our sites using Google’s Mobile Friendly Test. People who were confident that their website looked great on mobile devices suddenly questioned whether they really were. Recently, I learned that there are issues with Google’s mobile-friendly test. I just did a quick search and found “Flawed Google Mobile Usability Test Results” by Alan Bleiweiss on SearchEngineJournal.com. One of the things that Alan warns us of is that we may get a ““Your site is awesome!” result for a site that’s not mobile friendly at all. This algorithm update is expected to take a few days to roll-out. This update will only affect mobile searches. Google’s intention is to create good user experiences (UX). Mobile-friendliness will be gauged on a page-by-page basis. Results from checking your site using Google Webmaster Tools “Mobile Usability” feature and using Google’s “Mobile-Friendly” test may differ. From there, they go on to explain that the focus is on UX (User Experience) in general. My two cents on the topic of mobile-friendliness and whether or not Google’s tests are accurate and what we need to be doing to make our sites responsive, is that we can drive ourselves crazy with all this. Bottom-line, we need our clients/customers to have an enjoyable experience on our sites regardless of how they’re accessing them. I know that my WordPress theme is outdated and not responsive. So, it’s a better use of my time to move to a responsive theme and not try to dance around Google’s tests. Are you ready to move on? Did you hear that Google is planning to index our Tweets in real-time? Well, I’m not just going to tease you with that one. In my effort to post more frequently (and write fewer in-depth #FridayFinds), I still have the urge to share interesting posts with you. So, I’m not going to bullet-point the answer to that question but I will direct you to Eric Enge’s article Google Plans to Index Tweets in Real Time: How This Could Impact Your SEO on HubSpot.com. This could be something to keep an eye on. Have a great weekend everyone and I hope you have an awesome week ahead of you. I despwrately looking for articles that relate to the Accelerated Mobile Pages that could help pump up traffic to my blog. This is the newest trend that google is trying to implement. Maybe you have your helpful views on this AMP. Thanks for brining up this topic. To be honest, I hadn’t done any research on this topic until I read your comment on my other post. I found an excellent article on MarketingLand.com. It contains links to other articles and resources. If anyone else is interested, the URL is http://marketingland.com/library/mobile-marketing-news/amp-accelerated-mobile-pages. Thank you Sherryl. Thanks for the help. yeah, nice piece of information. as I am a newbie in SEO it was really helpful for me. i subscribe your site for more topics. Thanks for letting me know that you found my article helpful. SEO is a topic that I enjoy writing about because it is something that bloggers can (and should) incorporate into their writing. One of the things that Google weighs heavily when determining what to return in their SERPs (search engine result pages) is whether or not the content will fit the needs of the person who performed the search. After all, Google wants to make their users happy. So, bottom line, we need to be writing for people not search engines. Good luck with SEO. Sometimes the biggest challenge is to know what Google doesn’t approve of. For example, backlinks that we leave in CommentLuv links have the potential of both helping or hurting us. (BTW – I had to remove the link that you left with your comment because it took me to my RSS feed. I’m not sure why. It’s possible that it was a glitch on my end. I wanted you to know why I removed it.) Have a nice weekend! This article makes a strong case for podcasting and goes ahead to provide tools to make it happen. I believe some bloggers don’t start a podcast because of the-fear-factor. But, this article makes it easy to do. Thanks for the share. Wow! Something is happening with my blog. This is the second comment today that has ended up on the wrong article! (The post it’s appearing on is about Google’s mobile-friendly algorithm. By your comment, I can tell that you were commenting on Vernessa Taylor’s guest post about podcasting. I agree with you. She did an excellent job covering the topic and building a case for it. Honestly, I have to confess that I’m still not podcasting myself. I hope you beat me to it! Thanks so much for visiting and taking the time to join the conversation. You’re right. This comment was meant for the article on podcasting. I hope I beat you to it! I think we are all better off building our brand revolving around us rather than have several niche sites. For instance, I have two WP sites developed but one is a Niche site (my Miche business) and the other is my general blog. The general blog talks about all my interests. I get far more traffic on that site.People connect to you, not your product. Somehow, your comment ended up on my post about Google’s new ranking signal. I have a strong feeling that you meant to comment on one of my posts about combining multiple niche websites. Either way, thanks so much for reading my blog and for taking the time to join the conversation. I hope you’re finding articles that interest you here. I agree completely with you that people connect with individuals and not products. Having two separate sites sounds like a great solution for you. It’s more work than maintaining one website but as long as you’re up to the challenge, that’s great! As for my client who I combined the three sites for, over the years, her content had started to overlap significantly. It had reached the point where she was deciding which blog to post her article to based on the fact that she hadn’t posted there in a while. The good news is that consolidating her blogs and concentrating on her “Chocolatour” brand is working for her. She’s definitely generating more income now than she was before. Yes.. basically, you create a \”one time use\” virtual credit card with fixed amount of your choice. For example, if you want to pay someone $50, then you can create a VCC of worth $50 which can be used only once. It saves both time and money. Also, it saves you from all sort of misuse. We had been talking about virtual credit cards on my post “Keeping Your Online Business Secure” but somehow your comment ended up here. 🙂 I realize that anyone reading your comment may be confused but I understand it completely and I appreciate your providing us with that extra information. Thanks! Well, I have been wondering about the blogs lately, and notice they seem to be slower to make the switch to responsive design, but I believe it’s for good reason. As someone who has been finding themselves performing more SEO and web developer duties rather than content production as I prefer (and am more proficient with to be honest), I’ve grudgingly accepted I have to get a grip on this. Currently I’m working on my own posts regarding this, and some of what I am learning and deducing on my own as a result is unsettling. I’m using my own site as a test rat to try different mobile approaches, and I can tell you that regardless of what Google, or anyone says for that matters, the changes are significant and currently add quite a bit of complexity to pretty much everything, from development to SEO. Couple things I would suggest for anyone considering making the switch to mobile responsive design. Consider your niche. Some will benefit from the change, others not so much if at all. Blogs in particular currently don’t seem to be a high mobile traffic venue. E-commerce and tools sites (maps, information, etc) seem to be the be the biggest recipients, which makes sense since mobile tends to be a more application oriented user need, while reading and entertainment is more leisure and thus desktop effective. Pay attention to your analytics. If mobile visits up until this algorithm change are low or show little user engagement, chances are good your site isn’t one that will benefit from a change to mobile design. Of course this doesn’t take into account the possibility that your site might be too difficult to provide an effective mobile experience, thus mobile visitors leave quickly. Taken together with niche and other factors though, it can help greatly when making the decision to change. One thing I can practically guarantee though, is that this is just the beginning. I give it maybe 2 to 5 years before mobile responsiveness is applied to Google search across all platforms, meaning it will affect all searches eventually, not just mobile. Given that, it is probably a good idea to get a grip on it now rather than later, even if you don’t plan to make the change until in the future. Thanks so much for your added insight. It will be interesting to see what you come up with for a mobile approach. I’m still depending on a mobile responsive plugin for my site. Sometimes it works and sometimes it doesn’t. I tend to be fairly prolific when writing. So, I don’t get a ton of traffic from mobile devices. Still, I need a fresh clean design and I’d be a fool not to go with a responsive theme. It’s good to hear your observation that e-commerce and information/tool sites benefit the most from mobile traffic. If/when I create an eCommerce site, I’ll keep that in mind. The thing about blogs and mobile is that it cuts down on the number of comments that you get. Now, I know that comments aren’t important to some people and that comments aren’t the same as conversions but still, I’m proud of having an active community and I’m often told that the comments can be as valuable (or more) than the post. I’m finding that I lose my patience more often now when I come upon a site that isn’t responsive. If it’s a blogger who I know and respect, I’ll make the extra effort. If I’m a first time visitor, I probably will bail. As for commenting, I may comment on Facebook using my phone but I don’t comment on blogs. It’s just too frustrating. Hey Sherryl, all my blogs bar one was mobile friendly. That one ran on Thesis. I tried to upgrade but only got the screen of death. My solution was to convert that blog to the same theme the others are running. My problem was my websites were not mobile friendly. I’m not geeky enough to fix it and as stumped. Then it hit me, why not convert them to the WordPress platform. The theme I use is so flexible the websites look even better and are more responsive. Google is a pain with all it’s changes but sometimes change is a good thing. It’s unfortunate that there wasn’t an upgrade path from Thesis 1.x to Thesis 2.0. I understand it was a total rewrite but still. Having to totally rebuild our sites in a new version of Thesis seemed like a daunting task. (Coupled by the fact that many bloggers aren’t happy with 2.0.) BTW – I’m still running this blog on Thesis 1.8.6. I’m using the WP Touch Mobile plugin now and I believe that it’s enough to satisfy Google for the time being. It’s passing the Google friendly test and I don’t have messages in Google Webmaster Tools. My plan is to rebuild my site using a new responsive theme on a different host but on my terms. I’m not rushing into this in response to Google’s April 21st update. I’m glad to hear that you’ve already switched your blog to a responsive theme. Congratulations on doing that. Thanks for joining the conversation and sharing your experience with us. I appreciate it. Adrienne did mention she used a plugin on her Thesis 1.8 but that was after I changed to my favourite theme. The only reason I kept Thesis for so long was because I had paid for it and I hate to waste money. I understand your frustration with Thesis. I toyed with rebuilding my site with 2.0 for a long time. I own a developer’s license and (like you) I hated to waste the money. I’ve since come to my senses and I will probably go with a Genesis theme. That’s great that you’re ranking so well on those articles. Congratulations! Good luck figuring out how to duplicate that. Thanks so much for adding your insight. I hope you have a wonderful weekend! The concept is sensible, which is normally the case with Google (they have lots of smart people). The execution seems lame to me; Google should know better than me but in my experience their execution is much worse than their initial concepts. The sites of mine that they say are not mobile friendly are fine when I look at them as a human. I was concerned when they notified me so went and looked. I figured I would find good improvements I needed to make, but nope there was nothing to make them better – they are simple blogs. I checked your blog and it is a simple site. So, I was surprised to hear that you had received a notification from Google (that your site is not mobile friendly). I checked your home page, your blog page and a couple of individual posts (with Google’s mobile-friendly test). The only page that failed on your multipagerank.com site is your home page. So, if you could tweak that, you should be good to go. It could be as easy as switching to one of the newer WordPress defualt themes. Thanks for dropping by and sharing your experience with us. Yeah, it wasn’t that blog that Google said they didn’t like. I have something over 20 websites, I think they said they didn’t like 3 or 4 of them. Actually using the sites on mobile they are all fine – so it isn’t not being mobile friendly it is an issue with not matching Google’s software check. As you say, one of them they didn’t like was that main web site, but the users of that are happy and use it in their offices on desktops. There has been no drop in users, mainly the same people use it all the time (it is 6,000 on Alexa in India and 50,000 globally). Of the sites Google said it didn’t like 2 had some drop in visitors from search, nothing major though. And other some sites may have picked up a bit of traffic, again nothing major though. My philosophy is to provide users a good experience. Google sometimes has good advice, in which case, I will follow it. Google also acts like a bully telling people they have to do what Google wants or Google will punish them, that I don’t really care about, Google can go ahead and punish me, and their users if they want. Google is pretty good (even though they have some major flaws that last a long time) so I figure they will get around to fixing whatever failures exist in their code that falsely identify things as not mobile friendly that are (but just not in whatever way Google’s code currently uses to check). When we recently redid my site we checked and rechecked the site to confirm it was mobile-friendly on iPhone and iPad. We checked and confirmed each of my new website pages was mobile-friendly. Haven’t heard from Google there was a problem. So hopefully I’m in the clear! That’s wonderful Susan! I love your new site redesign. I know you approached that strategically. You must be relieved! I don’t know if I’ve visited your site on mobile yet. I’ll have to do that tonight. Very important point you mentioned in this post and while reading it I just checked a few sites of my clients and much surprised to see the one with biggest response is not mobile friendly. The most alarming point is that despite ok report from any responsiveness testing sites still some pages can’t be mobile friendly and for that one needs to do thorough analysis of his site. The theme factor is also very important and those manufactured before 2014 and are running without any update have more possibility of this problem. Thanks a lot for sharing this post that is any eye opener for those especially who do a shallow assessment of the responsiveness of their website. Thanks for sharing that with us. It is important to keep in mind that Google determines mobile-friendliness on a page by page basis. I have a couple of client sites that aren’t mobile friendly yet and mine isn’t either. We’re looking into responsive themes now. At least this update is not going to affect searches done on either desktops/laptops or tablets. So, I believe it’s best to not jump ship and settle on a theme that may not be the best fit long term. I just mentioned in my reply to Jeannette (who is using DudaMobile for a mobile version of her site) that we always have the option of using a default WordPress theme like Twenty Fourteen or Twenty Fifteen. As always, thanks so much for joining the conversation and sharing your insight. I’ll be by soon to read your latest post. Have a nice weekend! Hi Sherryl — As I mentioned last week, I use a third party — DudaMobile — to host my mobile website. It’s easy to set up and I’m happy with the way it looks and works. While you may want to change your theme for other reasons, I don’t think most people need to switch to a new theme in order to comply with Google’s “demands” that their site be mobile friendly. There are other third party vendors, too, that can host their sites without going through all the fuss and bother of switching to a responsive design. Recently, I saw someone mention that we shouldn’t automatically rule out using themes like Twenty Fourteen and Twenty Fifteen either. (Those are the two most recent “default” themes built by the WordPress team.) Those are mobile responsive, free and supported. As always, thanks for dropping by and joining the conversation. Have a great weekend! Hi Sherryl, This is the first time I’ve come across this. I’m in the process of changing my theme and updating my site so I’ll make sure I put this into practise. Thanks so much for a useful post. Off to check that Google link. It seems that most of the newer WordPress themes are responsive now but I’ve read that a few aren’t. So, it’s worth checking. I think I may have found a new theme for my site too. Welcome to my blog and thanks for joining the conversation. Thanks for this updates , my site have responsive theme and I have checked in every mobile device it is looking fine. This one is first article I am reading on Mobile friendly ranking. I have heard about compulsion of responsive theme for website . That’s great news that your site is on a responsive theme. Not only do you not have to worry about Google’s mobile-friendly update, your readers are having a good mobile experience. I guess I’m still a little confused about what Mary’s answer to how will mobile friendliness impact rankings. She said, “your tap targets/links to your buttons are too close together”. What does that even mean? See, there I go again not even understanding some of what they’re saying. If I get a new theme before then great, if I don’t then oh well. I’m not going to obsess over this because it’s just one out of 200 things already that Google looks at to rank our sites. From what I’ve heard over the last year most people aren’t even worried about that any longer. I think that’s because with referral traffic and them sharing our content it’s still showing up in the search engines without us having to worry too terribly much about whether Google loves us or hates us. Thank goodness for that. Thanks for the update and have a great week. This update has really caused a stir. Google has never promised/(threatened?) that an algorithm update would have a “significant impact” before. Then, there may be discrepancies between the results of their mobile-friendly test and the results of the “Mobile Usability” feature in Google Webmaster Tools. To top it off, they’ve announced a target date. When I looked at the reasons my site failed the mobility test, I received a similar message to what Mary said about ““your tap targets/links to your buttons are too close together”. I took it to mean that my menu items were too close together. I find that happens quite often when I’m accessing mobile-unfriendly sites on my smartphone. Sometimes, I have to expand my screen to get a tweet button to work. Other times, I give up. You’re in good company not worrying. In my post last week, I mentioned Rand Fishkin and the position that they’re taking over at MOZ. In his post on Google+ (on March 5th), he said: “We’re planning to roll out responsive design in the next few months, but I’m actually hoping we do it after April 21st so we can see whether and what the hit looks like from Google . . . “. It is great that social is showing up in searches. I for one hope that Google indexes more tweets! As always, thanks for dopping by and sharing your insight with us. I’m looking forward to what you’re brewing up for your blog. – I hope you have a great week too! Oh, and one more thing… there are other testers available. Read wordingwell.com/google-mandates-mobile-friendly-sites/ to see four other tools that people can use to check the responsiveness of their sites. Both of my sites are responsive, and have been for a long time. I also recently installed a new theme on Wording Well, and double-checked and triple-checked to make sure the theme was working well and is responsive. Good luck with updating your theme, Sherryl! Congratulations and thanks for wishing me good luck. I’m hoping to do more than just switch my theme. I’m really thinking about where I’m headed with not only my blog but my overall strategy for my business. Why not look at this as an opportunity right? Recently, Don Purdum guest blogged here. (I linked to his post below.) His article “People Will Buy From You When They Understand What Business You’re Really In” got me thinking. I hope you’re having a great weekend. Thanks so much for dropping by and joining the conversation. Pretty sure my webmaster handled this stuff 😉 But I double check at times and my site looks fine on my tablet. I’ve checked on iPhones and iPads too and it was A OK. So far, so good, so I guess I’m well placed for Google’s big, much-needed change to cater to the growing legions of mobile users. Glad you checked your site to confirm it was mobile-friendly on your iPhone and iPad. I’ve been reminding everyone to confirm each of their website pages is mobile-friendly using Google’s online mobile-friendly test or Google’s Webmaster Mobile Usabillity Report. That’s what Google will use to determine if your website pages are mobile-friendly, or not. If Google found issues with your site not being mobile-friendly, you or your webmaster would have received an email notification alerting you of the issues. The notification would also include links to online resources to resolve the issues and make your site mobile-friendly. Thanks for the reminders that Google will be determining whether or not our sites are mobile friendly on a page by page level and that the alerts that they are sending have links to online resources as well. In that discussion, Leora said shared a link to show how to add the viewport function but she also said “it seems easier to get a responsive theme”. I agree. Thanks so much for adding your insight. I’m glad you discovered my blog and I hope you’re having a great weekend. “Tweeting from Bali” . . . I always love your sign offs Ryan. It’s good to hear that your site is in good shape for Google’s new ranking signal. Your blog is an easy read. So, I would imagine that you have a lot of readers who access your site through mobile devices. Your blog is fairly new isn’t it? (I still remember when you switched gears, abandoned your old blog and launched Blogging in Paradise.) I’m guessing that you may have started out with a responsive design. Whereas, I’m still using the same theme that I started out with five years ago. It’s time for a change and Google’s new update is just the push I need. Great post, Sherryl! You covered a lot of the issues. People shouldn’t panic – this does not effect desktop search. Do your research, then make your decisions. I wanted to thank you for sharing the link to that Q&A session with our LinkedIn group (Bloggers Helping Bloggers – BHB). I had been thinking of writing a follow-up post to my last article and that was just the nudge that I needed! You also introduced me to Deborah Edwards-Onoro (and her 5 Takeaways). Plus, that led me to being tagged in the tweet about Google open office hours (@googlewmc). All of that led to more content to share! I think responsive themes would be great idea for a post. You can tell by reading that message thread (in our LI group) that there’s a need for a “voice-of-reason”. As you just said, simply switching to one of the default WordPress themes is a viable solution. There are cost effective options short of a total redesign. It depends on our current situation and our overall strategy. Thanks for helping to spread the word about the mobile-friendly ranking signal. I know there’s a lot of confusion out there. You’re spot on with your recommendation to focus on creating a good experience for website visitors. Stop chasing the algorithm. My biggest takeaway from Google’s Q&A session this week: the change affects mobile searches only. Sherryl, I appreciate the shoutout and link to my blog post. It’s so nice to meet you here on my blog! I’m glad Leora introduced us through Twitter. I did not know about Google open office hours (@googlewmc) until I saw that tweet. That was my biggest takeaway from the Q&A session too! (That this update will only affect mobile searches.) Up until then, there had been speculation that sites that were mobile friendly may get preference in desktop searches as well. So, in the future, webmasters may turn to creating separate mobile websites? Wait! Isn’t that where we started (years ago) when everyone was buying “.mobi” domains? (I have one that I’ve held onto for years. Previous post: Are You Ready for the Google Mobile Friendly Algorithm?